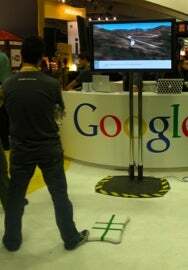 If you're at the show, be sure to stop by the Google booth. They have an interesting hack that let's you surf across the world. As you stand and lean on a Wii Fit, you watch as a little truck on the screen slides across the landscape, controlled entirely by your movements. I know what you're thinking: It's just like being the Silver Surfer. Well, except that you can't fly. Or go into outer space. Or fight the Fantastic Four. But still, a cool experience that you can't get anywhere. Unfortunately, it's not a product for public consumption, so you won't be able to commandeer a Wii Fit pad and turn it into a world-surfing experience, but for those on the show floor, it's definitely worth a quick stop.